When I was in college, I used to make mixtapes. They often had a theme - happy songs, songs for a rainy day, songs that make me want to dance ... 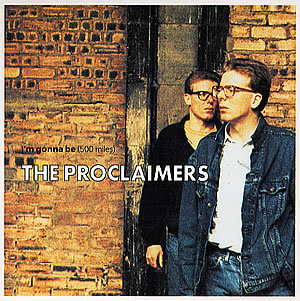 If I was making a mixtape today of happy songs, "I'm Gonna Be 500 Miles" by The Proclaimers would definitely be on that tape. This song is by the Scottish band The Proclaimers. This band features twin brothers Charlie and Craig Reid. Charlie Reid wrote "I'm Gonna Be 500 Miles" in 45 minutes while waiting to travel. How can you not love that?! Do you remember "I'm Gonna Be 500 Miles"? I'd love to hear from you in the comments, below. I love that song! I smiled just reading the lyrics. I love this song, every one used to make fun of me for loving it, lol. I still like when it randomly plays at a store. I didn't even realize it from a movie, haha. Me too -- and this is one that randomly seems to play in stores and restaurants.